Reference number for this case: 2-oct-54-Clermont. Thank you for including this reference number in any correspondence with me regarding this case. It seems that according to the regional Press of the time, on October 2, 1954, around 10 a.m., in Clermont-Ferrand, at the modern college, during the break, some girls stopped playing because something had caught their attention in the sky, above Puy-de-Chanturgues. At the same time, Rue Diomede, one Mrs. S. also looked up, to watch at a strange light shining in the sky. She first thought she was discerning an advertising balloon, but by paying attention, she felt that it was not that because it was a metal mass, almost motionless, but animated by a slight oscillatory movement. The thing suddenly took speed and went out of her field of vision, going to the North-North-West direction. In the surrounding houses, other neighbors, including a Mrs. Lacoste, had told of a similar display. Other press reports say the thing "was moving vertically" and was of shining white color. When it was only 150 meters away, they felt a curious sensation and were nailed to the spot. At this point there was an odor of nitro-benzine. Soon the craft moved away, the discomfort ceased and the saucer disappeared. The other saucer was seen above the coasts of Chanturgues, near Clermont. It moved vertically and was of a brilliant white. Aimé Michel reports that there was a sighting on October 2, 1954, in Clermont-Ferrand, France. The magazine indicates that on October 2, 1954, in Clermont-Ferrand, Puy-de-Dôme, an object has been seen above Puy-de-Chanturgues, and left in the North-North-East direction under the eyes of numerous witnesses including Mrs Lacoste and college students. The magazine indicates Aimé Michel and the regional newspaper La Montagne for October 4, 1954, as sources. The two authors indicate that in Clermont-Ferrand in the Puy-de-Dômeson October 2, 1954 at 10:00 a.m., several people observed a luminous machine of metallic color which oscillated in the sky. After having remained motionless a few moments, it fled at a high speed in the North-western Northern direction. Belgian ufologist Godelieve van Overmeire notes in her catalogue that in France, in 1954, on October 2, in Clermont-Ferrand, around 10 o'clock several people see a luminous machine oscillating slightly in the sky, shining like metal, which, after having hovered a few moments, quickly sprang in space in direction of the NNW. The source is indicated as M. Figuet / J.L. Ruchon in "Ovni, Premier dossier complet..." Alain Lefeuvre pub. 1979, p. 107. 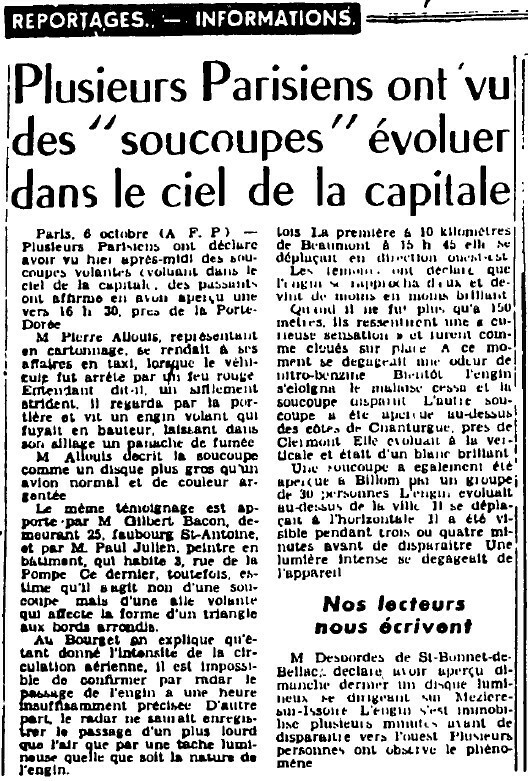 Luc Chastan indicates in his database that in the "Puy de Dômes [sic] (63)" in Clermont Ferrand, on October 2, 1954, at 10:00 hours, "Several witnesses observed a luminous machine color metal which oscillated in the sky. After having remained motionless a few moments, it sprang at a high speed in the North North-West direction." *Oct. 2, 1954 - At 10:00 o'clock in the morning several people in the city of Clermont-Ferrand, Puy-de-Dome department, France saw a luminous, metallic object oscillating in the sky, then fly off rapidly to the north-northwest. (Source: Michel Figuet & Jean-Louis Ruchon, OVNI: Le premier dossier complet des rencontres rapprochees en France, p. 107). The data coming from the Press is not clear enough and not coherent enough to allow me to eliminate a balloon or an airplane or a helicopter. So the case remains unidentified, but with very little strangeness. 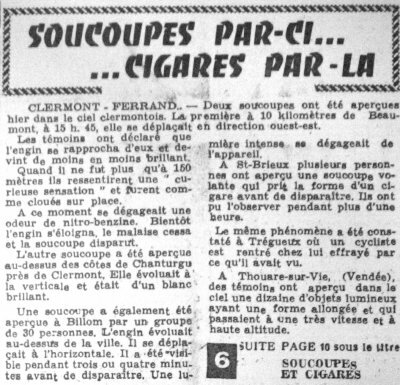 [---] Article in the regional newspaper La Montagne, Clermont-Ferrand, France, October 4, 1954. [fr1] "OVNI, Premier Dossier Complet des Rencontres Rapprochées en France", book by Michel Figuet and Jean Louis Ruchon, Alain Lefeuvre publisher, France, page 107, 1979. 1.4 Patrick Gross january 4, 2017 Addition [pc1]. 1.5 Patrick Gross April 21, 2019 Additions [lh1], [ev1], Summary. Explanations changed, were "Not looked for yet."